"...as I was harvesting the sumac, I was really paying attention to them. And even before, I was talking to them." 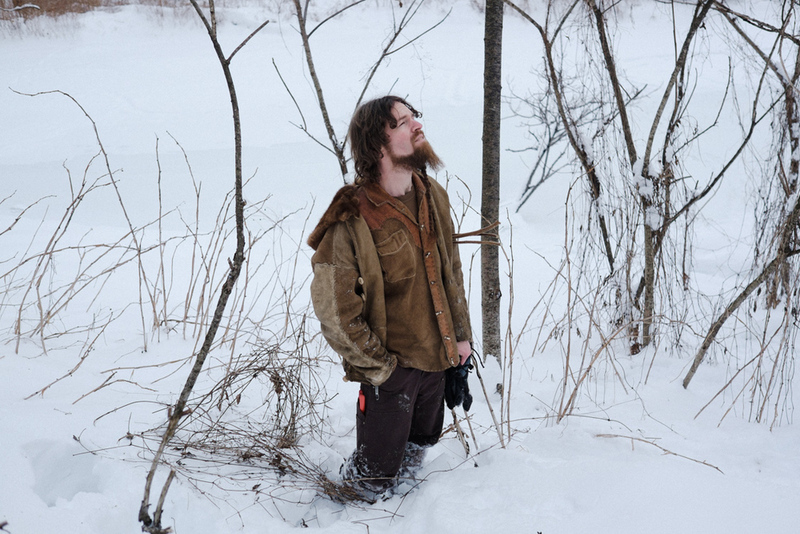 Nick Neddo is standing in his Vermont house, overlooking a field. Wood is stacked outside, and a bright stove pipe goes up from a woodstove in the center of the main floor. In the distance a mountain range underlines the horizon, and pine trees edge the cleared areas. I sit with him upstairs, and as we talk Nick paints. He is working on a picture of a sumac plant, made with sumac leaf ink. As we talk, we sip tea. The colors of everything in the room, including the cup I place on his desk, have a similar tone: natural, subdued, earthy. Everything matches, even his leather jacket, which he made and tanned himself. He tells me about how he makes the ink he for his picture. “First I harvest leaves, and make a really bitter tea from them,” he says. Sumac leaves, deep red, serrated and thin, fill a woven basket next to his desk. “Then I mix vinegar with rusty metal I find laying around, make a little rust farm, and then combine the two together.” The ink is a warm grey, and darkens as it dries. Nick grew up spending time outdoors, making treasure maps and wandering around with his brother. It was mid April when he first tried to stay overnight in a debris hut, a shelter constructed of leaves, branches, and sticks, and the temperature fell below freezing that night. After making roughly his 50th hut, he has perfected them. He can make them quickly, and, even when the temperature is below zero , can sleep warm in them all night, the only heat source being his own body. This knowledge has enabled him to teach many people how to do the same, which he has spread through the ROOTS school, a primitive skills school in Bradford, Vermont. We finish our tea and travel to a nearby river to harvest sumac branches. We walk down a frozen bank, our feet deep in powdery snow, and come across tracks. Nick examines them, bending down close to the ground. The spacing and size look like coyote, though they could be mistaken for fox. The tracks lead over an upheaval of ice, where we find urine. Nick bends down to sniff it, and I join him. It is musty, very strong even in the cold air. Coyote, he decides, and if not, definitely canine. Further downriver we find hedges of sumac, flinging their arms skyward. Atop each branch is a cone of deep red berries. Nick finds a plant that is damaged, a gash running down one side, and he clips off a branch. “This plant is already dead,” he says, selecting another shoot. He pushes the main stem back and forth, it moves easily; the roots have mostly let go. He leaves it standing and moves on. We duck through the grove, and Nick cuts more stems. The snow is waist-deep in places, and the landscape around is silent. We go down the hill to the river, and walk back. Along the edges the ice crunches, and seems thin, but it holds. Nick carries the long sticks of sumac under one arm, planning to make pens out of the naturally hollow wood. “You didn't see this,” he says later, back at home, “but as I was harvesting the sumac I was really paying attention to them. And even before, I was talking to them. I knew where they were a long the river bank and I was projecting my intention: ‘Hey, you guys, I'm coming to harvest some of you.'" The reality, Nick implies, is that the natural world is not there to just give us things whenever we want. Living in and with nature is a conversation. You ask the forest to give you things, and you harvest them in such a way as to not disturb the forest, or even in a way that helps. Foraging, he says, is participating in an ancient, sacred dance of give and take. Nick pulls out a knife and carves one of the sumac sticks, first removing the bark, then fashioning a nib. 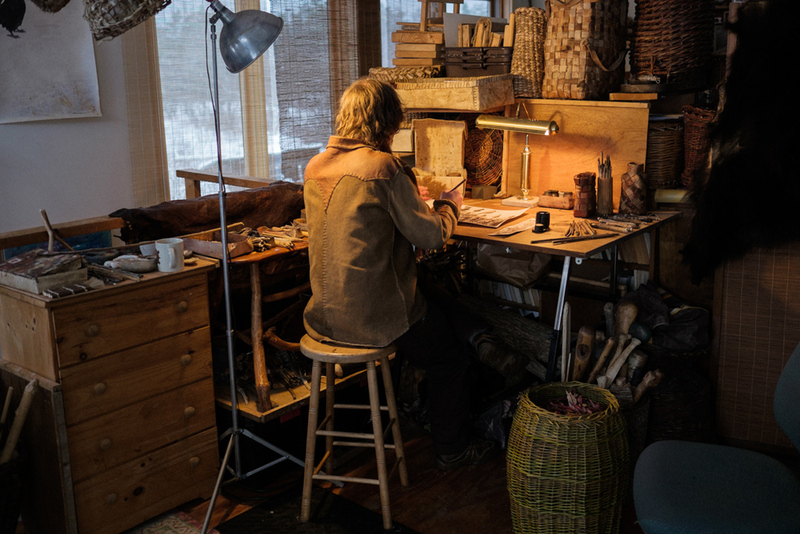 He cuts a piece of birch bark, and rolls it in on itself to make a minute reservoir. He dips the pen into the ink, and tests it, drawing lines, making dots. Then he sets to work, sumac pen in hand, filled with sumac ink, creating an illustration of sumac. I look over at the painting, and wonder what there is left to add. Time passes, and the even grayness outside the windows fades. The studio darkens, and Nick turns on some lights. He sits at his desk, dipping and drawing with this sumac pen. There is a strange cyclic feeling to all of this, like a koan: something not intellectually graspable, but feeling somehow like a completion. As I drive home on the snowy, frozen roads, stars vault above, and shapes of trees and outbuildings loom. If a storm came, and you walked out into those woods, you might never come back. I think of this, as I head downhill into a place where the darkness seems to have pooled, and all the traces of the farms nearby have vanished. An old feeling creeps up, bringing a gentle smile to my lips. It reminds me, as it always does, of my place in the world. To see more stories by Hudson Gardner, visit him at HudsonGardner.com. And to learn about Nick Neddo's art and primitive skills, check out his book The Organic Artist (Quarry Books, 2015). Signed copies are available at NickNeddo.com.